The dichotomy concerns the so-called angular momentum (per unit mass), that in physics is a measure of size and rotation velocity. Spiral galaxies are found to be strongly rotating, with an angular momentum higher by a factor of about 5 than ellipticals. What is the origin of such a difference? An international research team investigated the issue in a study just published in the Astrophysical Journal. The team was led by SISSA Ph.D. student JingJing Shi under the supervision of Prof. Andrea Lapi and Luigi Danese, and in collaboration with Prof. Huiyuan Wang from USTC (Hefei) and Dr. Claudia Mancuso from IRA-INAF (Bologna). The researchers inferred from observations the amount of gas fallen into the central region of a developing galaxy, where most of the star formation takes places. "Till recent years, in the paradigm of galaxy formation and evolution, elliptical galaxies were thought to have formed by the merging of stellar disks in the distant Universe. Along this line, their angular momentum was thought to be the result of dissipative processes during such merging events" say the researchers. 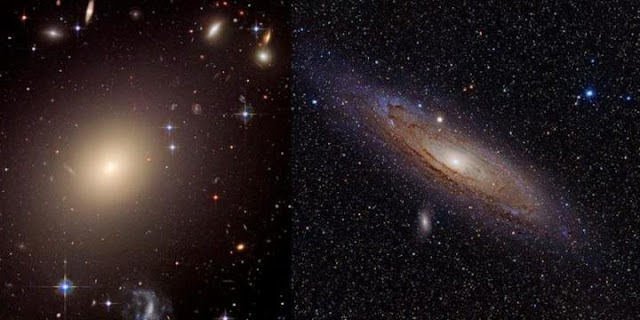 Recently, this paradigm had been challenged by far-infrared/sub-millimeter observations brought about by the advent of space observatories like Herschel and ground based interferometers like the Atacama Large Millimeter Array (ALMA). These observations have the power of penetrating through interstellar dust and so to unveil the star formation processes in the very distant, dusty galaxies, that constituted the progenitors of local ellipticals. "The net outcome from these observations is that the stars populating present-day ellipticals are mainly formed in a fast dissipative collapse in the central regions of dusty starforming galaxies. After a short timescale of less than 1 billion years the star formation has been quenched by powerful gas outflows". Despite this change of perspective, the origin of the low angular momentum observed in local ellipticals still remained unclear. "This study reconciles the low angular momentum observed in present-day ellipticals with the new paradigm emerging from Herschel and ALMA observations of their progenitors" conclude the scientists. "We demonstrated that the low angular momentum of ellipticals is mainly originated by nature in the central regions during the early galaxy formation process, and not nurtured substantially by the environment via merging events, as envisaged in previous theories".